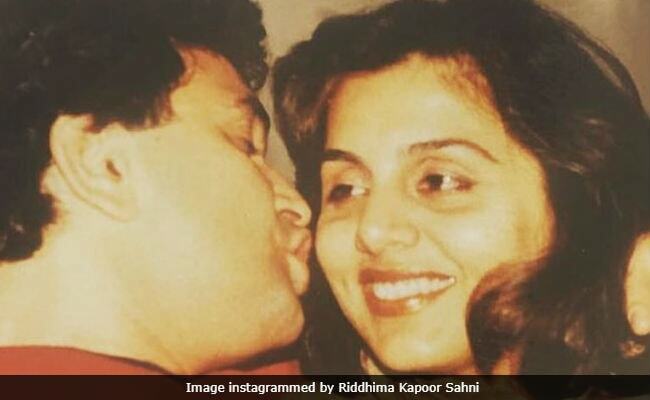 One of the most adored Bollywood couples, Rishi and Neetu Kapoor, are celebrating their 38th anniversary today and on this occasion, their daughter Riddhima Kapoor Sahni shared a heartfelt post on Instagram. "To my lifelines - my universe!!! I love you both!!! 'Happy anniversary mom & papa," she captioned a throwback picture. The popular onscreen couple of the Seventies - Rishi Kapoor and Neetu Kapoor - broke many hearts when they married on January 22, 1980, in the presence of their respective families and friends from Bollywood. Rishi Kapoor and Neetu Kapoor's first onscreen association was for 1974 film Zehreela Insaan. Neetu Kapoor was all of 16 but Rishi Kapoor was 22 when they co-starred in Zehreela Insaan. Rishi Kapoor reportedly fell in love with Neetu Kapoor while they were filming. He also recalled the moment he realized this on the The Anupam Kher Show. "I remember I had an argument with my girlfriend at the time and I was very heartbroken. Trying to win her back, I had taken Neetu's help in writing telegrams to my girlfriend while the two of us were shooting for Zehreela Insaan," he said in an episode which aired in 2015. He also added: "As time passed, I began to realize that Neetu is the one for me as I began to miss her when I had gone to Europe for a shoot. Ironically, I sent her a telegram from Europe to Kashmir saying that I was thinking of her." Rishi and Neetu Kapoor worked together in 19 movies, and gave some memorable hits- Kabhi Kabhie, Amar Akbar Anthony, Rafoo Chakkar, and Khel Khel Mein. They were last seen together in Besharam (2013), also starring their son Ranbir Kapoor. Neetu Kapoor may seem selective with her Bollywood projects (her last film being Besharam), however, Rishi Kapoor has his hands full with upcoming movies, 102 Not Out, Manto and Rajma Chawal, all releasing in 2018. Happy Anniversary, Rishi Kapoor and Neetu Kapoor!